There’s no thought in Scone trainer Stephen Jones’ mind of conceding Sunday’s all important Country Championships Wild Card to the favourite Noble Boy. Stephen Jones Credit: Bradley Photos. 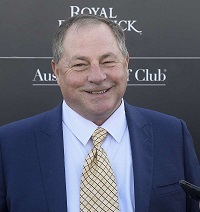 Quite the opposite, Jones is confident Hit The Target can not only qualify for next month’s final but win his way there through the $50,000 feature at Muswellbrook over 1280m that will finalise the 16 horses to line up at Randwick on April 6. Hit The Target ran a gallant third in the Hunter & North West Qualifier at Tamworth after drawing a wide alley but luck has swung his way for his second chance. “It was a terrific run, the winner didn’t leave the fence and had all the breaks,’’ Jones said. “He had to do it tough, be used up and was off the track and I think he should have won the race. “I was that pleased with the run but I wish he’d run second and we’d have been in. Hit The Target has won three of his six starts to date, Noble Boy has won four of his five so both lay claim to being the most progressive horses in the Wild Card. Jones said the favourable gate for his four-year-old, as opposed to Noble Boy’s 14, is an edge but he’s bullish enough to suggest Noble Boy has to beat Hit The Target not the other way around. “They have a bit of a rap on him but I have a rap on mine as well,’’ he said. “He’s a great horse to train, he’s never given us any problem and everything is good with him. Hit The Target is a $51 chance in TAB's all-in Final market while Noble Boy is equal favourite at $4.50 with Grafton winner La Scopa. The Wild Card was won last year by Don’t Give A Damn who then ran second to Victorem in the $500,000 Newhaven Park Country Championships Final (1400m). Jones is taking promising youngster Cassy’s Sister to Muswellbrook for the Tab.com.au Starmarker Handicap (1000m) and suggests she’s city class, if not now but in time. The filly won brilliantly on debut at Quirindi then Jones sent her to Randwick where she finished a game fourth behind subsequent Group placegetter Stronger and recent Hawkesbury winner Dresden Green. Like Hit The Targrt, the barrier gods have been kind to Cassy’s Sister for Sunday’s race. “It was a very good run (at Randwick), again we drew an outside gate and had to be used,’’ he said. “She’s a better filly when she can hop out and not be used up so much. She has plenty of ability and is a very nice filly.